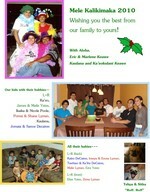 Malama Pono this holiday season! Keep safe. Our trip to Japan last Oct 2009. Family did a Hawaiian Concert in Tokyo. Da kids....all 6 of them (that was in 2006 at Kaulana's grad pa'ina)....one more to go.